Protective Boot Mat Trim To Fit - This boot mat may not fit your car boot perfectly but it can be cut to fit if needed measures at 120cm x 80cm. - Please measure your cars boot to avoid disappointment - Trim for tailored fit - Cutting guidelines - Black Rubber - This boot mat will prolong the life, look and value of your vehicle by protecting its interior - It will fit perfectly in most car boots but can be cut to size if needed (cut along the lines simply and easily without damaging the boot mat in any way) - The boot mat is made from a heavy duty tough black water resistant rubber - This boot mat will protect your boots original carpet. 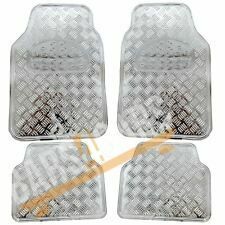 - This product is a must have for every vehicle. - Ideal to keep boot carpet clean and free from dirt, dust, oil, pet hair, . 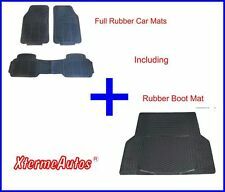 UNIVERSAL BOOT LINER ORGANISER / PROTECTOR Complete protection of boot area. Folds out to protect bumpers during loading/unloading. Protects bumper and boot from muddy and wet pets. Integral organiser pocket to keep boot tidy. * COVER BLACK IN COLOUR * HARD WEARING , HEAVY DUTY Dimensions: 106cm x 97cm x 37cm 100% Nylon Very tough * IDEAL FOR WORKMEN , TAXI DRIVERS , MECHANICS ETC Garden refuse * IDEAL PROTECTION FOR DIRT STAINS , FOOD , DRINK PETS, MUD, PAINT ,Oil * EASY-ON AND EASY-OFF * WIPE CLEAN * NYLON MATERIAL PROTECTS UPHOLSTERY SEAT COVERS *WATER RESISTANT, FIRE PROOF ,STATIC PROOF FAST DISPATCH PLEASE NOTE Important notice BEFORE ordering Please DO NOT rely on the compatibility list to make your decision of parts, as cars come with. 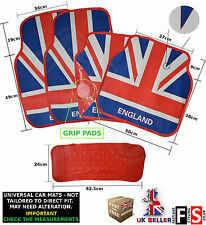 Front Pair of All Weather Rubber Car Mats Dimensions: 63.5cm x 39.5cm These mats are a universal fit They will fit almost every vehicles footwells Very Durable They have stud grip anti-slip backing to prevent the mats moving about in the footwell (safe and secure) Car mats are an essential for all cars in order to protect the cars interior and original carpet. Car mats prolong the life of there interior and by protecting its original carpet it keeps the cars value at its highest. 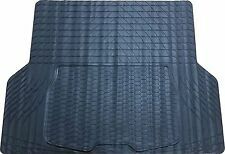 The mat is easy to fit and will protect your cars interior from spillages, dust, dirt, pet hair, pet spillages, shopping spillages, oil, mud, etc. FAST DISPATCH PLEASE NOTE Important notice BEFORE ordering Please DO NOT rely on the compatibility list to make your decision of parts, as cars come. 4 PIECE SET OF CAR MATS Dimensions: Front: 59cm x 42cm Back: 36cm x 27cm 4 Piece Mat Set (2 front mats 2 back mats) These mats are a universal fit They will fit almost every vehicles footwells (Will not fit Jeeps people carriers with joining back seat mats because these come with two single back mats) Made from Hard wearing materials Very Durable They have stud grip anti-slip backing to prevent the mats moving about in the footwell (safe and secure) These Mats will transform the look of its interior FAST DISPATCH Car mats are an essential for all cars in order to protect the cars interior and original carpet. Car mats prolong the life of there interior and by protecting its original carpet it keeps the cars value at its highest. These car mats are made from hard wearing. 4 PIECE SET OF CAR MATS Dimensions: Front: 63cm x 44cm Back: 36cm x 24.5cm 4 Piece Mat Set (2 front mats 2 back mats) These mats are a universal fit They will fit almost every vehicles footwells (Will not fit Jeeps people carriers with joining back seat mats because these come with two single back mats) Very Durable They have stud grip anti-slip backing to prevent the mats moving about in the footwell (safe and secure) Easy to clean just simply wash clean These Mats will transform the look of its interior FAST DISPATCH Car mats are an essential for all cars in order to protect the cars interior and original carpet. Car mats prolong the life of there interior and by protecting its original carpet it keeps the cars value at its highest. They are super stylish and hard . 4 PIECE SET OF CAR MATS Dimensions: Front: 65cm x 44cm Back: 39cm x 28cm 4 Piece Mat Set (2 front mats 2 back mats) These mats are a universal fit They will fit almost every vehicles footwells (Will not fit Jeeps people carriers with joining back seat mats because these come with two single back mats) Made from Hard wearing materials Very Durable They have stud grip anti-slip backing to prevent the mats moving about in the footwell (safe and secure) These Mats will transform the look of its interior FAST DISPATCH Car mats are an essential for all cars in order to protect the cars interior and original carpet. Car mats prolong the life of there interior and by protecting its original carpet it keeps the cars value at its highest. These car mats are made from hard wearing.